​Quartz is a naturally occurring substance, and in ground-up form it is combined with resins to form a hard surface much like engineered granite. Most quartz countertops are well over 90% quartz, which gives it the hardness and lack of porosity needed for the heavy demands of cooking. Some manufacturers also combine antibacterial substances. Breton, an Italian company, patented the process of forming solid surfaces from quartz and resins. Numerous companies such as Cosentino (Silestone), DuPont, Cambria and others used Breton’s patent for their own type of quartz countertops. For example, DuPont's version of the quartz countertop is called Zodiaq. Silestone's quartz is simply Silestone (since this is their flagship product). 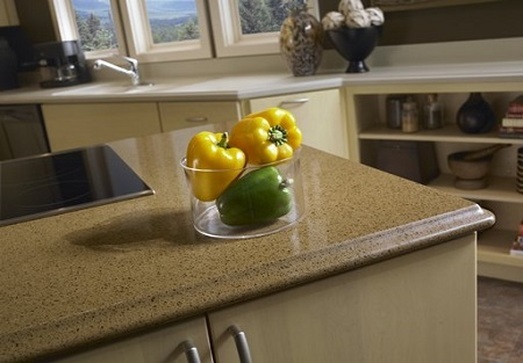 The chief benefit of the quartz countertop is its natural luster. Whereas pure polymer-based solid surface countertops such as Corian have a hard time achieving a deep, three-dimensional appearance, it's easy for quartz countertops to have this because of their natural appearance. Also, quartz is extremely hard and makes for a good work surface. When dealing with natural slab granite you're going to have a lot more problems with potential cracks and staining than you will with quartz. Also, the installers have a bit easier time dealing with quartz than they do with granite because it is a more forgiving material for fabrication. 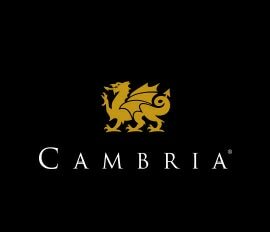 Because quartz countertops are engineered, almost any type of color can be brought out in the surface by means of pigmentation. Not only that, but other types of organic materials such as stone and glass can be incorporated into the quartz-resin mixture. For anyone who wants a granite countertop, it is worth investigating quartz counters as a viable alternative.